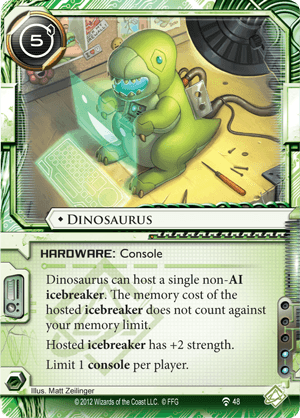 Dinosaurus can host a single non-AI icebreaker. The memory cost of the hosted icebreaker does not count against your memory limit. Hosted icebreaker has +2 strength. +2 Strength one any Non-AI Icebreaker hosted on it and it discounts the memory cost, Is it Worth it? Its a Green Dinosaur come on. Takes up the one console slot, arguably its always going to be better to run Vigil, Desperado or Astrolabe. Cannot Host AI breakers, which are some of the cards that could really use a St boost. Personal Touch +1 St for two credits (Taking Yog past Lotus Field, and Makes femme as good as Mimic) Downside is it can't really be used on Disposable Breakers without losing it. Datasucker? Arguably Increasing and Lowering Strength is exactly the same, it only really matters one around three cards (Lotus Field, Wyrm, Parasite) using this in combination with less Efficient Breakers like Femme or Pipeline may be better then Dinosaurus for boosting efficiency and won't take up a console slot or cost 5 credits. Arguably Dinosaurus is...pretty bad. But it still has its uses (At least until Anarchs get a Native ST boost on Yog, but even then Personal touch is a better choice than Dino) and it has certainly shown up in a few sage decks. if I ever rated cards out of 5 this would get a 2, which Incidentally is the Influence cost and the number of times I ran it before I gave up and put it away in the box. So. Endless Hunger is not an AI breaker. The practical side of this interaction is saving four MU and being able to use a standard breaker suite but then "oh also I've got this ETR breaker I can feed my exhausted counter-based breakers and other cards to". Given how overwhelmingly powerful Endless Hunger is, the ability to use it in concert with standard breakers without having to go overboard on +MU effects is actually pretty nice. It can save you a lot of credits in the long run if the corp has enough ETR subroutines sitting around and you have a few exhausted or disposable cards, and a one-of in a Shaper deck already running Dinosaurus can be a nasty surprise if you bring it out at the right time. It's definitely janky (Hunger is basically not going to be usable unless you have Dinosaurus available to host it on and it makes your console a huge target if the corp has ANY way to destroy it), but the raw power can allow you to do some ridiculous things especially if you deploy it late game and just devour the rest of your board for a series of game-winning accesses that were completely unfeasible before now (That's a nice Curtain Wall you have on your scoring remote there...), and the cost of inclusion isn't too high if you're already using this console for other things and you have tutors to fetch Hunger when it's actually necessary so you only need one of it. The FUN side is having a 13-strength icebreaker that basically amounts to Dinosaurus becoming possessed by Apex and devouring puny ICE. OM NOM NOM!